Let me just start by saying if you are trying to make it to this spot you might want to make sure you do so early, it is very small and with only 6 spots it gets packed quickly. If trying to get here on a weekend, GOOD LUCK! I recommend weekday excursions here since you cannot reserve and it is first come first serve. So what makes this spot so appealing?? Well to start with it is FREE!! Yes, in all the camping which you have to pay for out by Zion this one is one of the few you will find that have limited amenities and is in fat free to visit. Of course with that being said it is popular. Not all vehicles can make it out to this site and depending on what the weather has been a smaller lower car might struggle in some places if there is wash out in the region. I made it in my small Nissan on the day I visited only to find it was already occupied. The sites here are pretty basic, no running water at the sites at all. Pit toilets were well maintained and stocked. Each campsite was large enough for comfort from your neighbors and had a picnic table and fire ring. The camp is at a high enough elevation that it gets pretty cool up there at night. I'd say at any given time it is probably 10-20 degrees cooler than the lower areas of Zion. I had on a light jacket exploring the camp and a wind nearly cut right through me mid day. One of my favorite things about this camp was the access it has to the West Rim Trail, you can access it quickly from this area. Along this trail you can get some of the best overlooks in the park at some of the highest points. You can also use this trail to walk almost entirely around the park from big trail to big trail. Bring everything!! Make sure that includes lots of water because you will not find a water spigot anywhere near you and if you plan on hiking from this camp you will need it. Try a solar shower here, there are great sunny spots to set up a solar shower and let it heat up midday. Check weather conditions. This area has signs posted about frequent lightening, you can avoid this by simply checking the weather to see if you are at risk. Lava point is pretty deep into the park, so it takes a little while to get here from the south entrance. It's a very tiny camping area, with like five or so sites. Also, I think its only open during the on season and closes around the fall time. 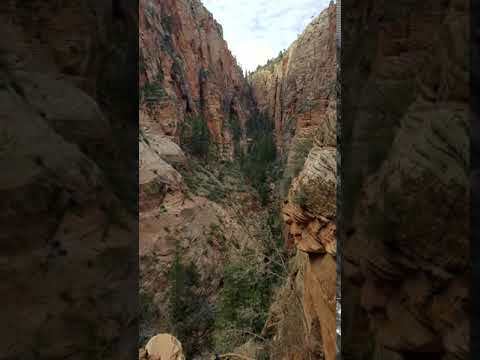 While you're in Zion, you gotta check out some awesome trails. Angel's landing is a great hike. Don't do it if you're afraid of heights though, because there are some pretty sketchy spots. Also check out The Narrows. You're walking through water the whole way, so make sure you get some good socks and shoes. Also check out the museum in the park. Ranger Review: Humangear at Lava Point Campground in Zion National Park! We loved camping here! The campground is around 7000' so it stays fairly cool even in the blistering heat of the summer. and even if the summer temps are too hot there are plenty of canyons to explore nearby as well as Kolob Reservoir. The most famous canyon nearby is the famous Subway route through the Left Fork of North Creek aka "The Great West Canyon" Due to recent increased popularity the park only allows 80 people through a day combined from both the top down routes and the single approach from Left Fork TH. In order to go through it from top or bottom you'll have to apply for a permit at the NP website and then pick it up at a Ranger's Station before heading in. The campground itself is pretty small but each has it's own picnic table, fire ring, and mini dumpster. There are 6 campgrounds and they fill up fast, real fast! We got there at noon and by 2 there were no campgrounds left on a Monday in September. Some other awesome bonuses about this camp is that its free and offers a great nearby lunch spot at the namesake Lava Point which is a basalt point that overlooks much of the main canyon of Zion National Park and the West Rim Trail! Great campground, off the beaten path, good to get away from the masses. Over looks the entire valley. Only 6 spots though, first come first serve, no reservations needed. This site is camp where you find space. It is not very crowded but there is traffic. The campsites are beautiful as they look at the Kolob reservoir. The water is cold during July but incredibly refreshing. Great fishing with a better view. I find that this is the best way to refresh yourself after a long day in Zion as it doesn't get nearly as hot here as it does in the valley. A little out of the way from the main road in Zion but so worth it! First come-first saved basis only and only a total of about 6 camp sites total but much cooler in temperature than the main campgrounds and way less crowded in the summer. Also only a short drive to Kolobob reservoir, which is definitely worth a visit if going to Zion :) Its our favorite secret little gem. This campground is typically open May-September, weather dependant. Lava Point is at 7,890 feet, off the Kolob Terrace Road. It takes approximately 1 hr and 20 minutes to drive to the campground from the South Entrance of Zion Canyon. There are 6 primitive campsites available first-come, first-served, pit toilets, and trash cans, but no water. Vehicles longer than 19 feet are not permitted on the road to the campground. We arrived at 3PM and all 6 spots were taken. Luckily someone agreed to share! The spots are large and accommodate several tents and most fit 2 cars. There is a picnic table and fire ring at each spot. There are mens and womens pit toilets. Most notable is the plastic and aluminum recycling - we were very impressed.